Why undertake an Associate Degree of Christian Thought and Practice? The Associate Degree of Christian Thought and Practice course is an undergraduate award that provides an opportunity to undertake some theological study with special focus on Christian Thought (including Biblical Studies, Theology, and Humanities in the Christian Tradition) or on Christian Practice (including Christian Life and Ministry). All course units are undertaken at AQF Level 7. The special focus is achieved by completing a major in the area of interest. What do I need to gain entry? Meet the English Language requirements for entry to the course. If your previous studies were undertaken in another language you’ll need to complete an IELTS test and have a result of 6.5 with no score less than 6.0 in all bands of the test. How long will I be studying for? 2 years full time or up to 6 years part time. The maximum time allowed for the completion of the course is 6 years. Full time is usually 3 or 4 units per semester, part time is 1 or 2. The fees per unit and indicative annual fees differ between Teaching Bodies. There is a chart available here, but please contact the registrar at the appropriate Teaching Body for further information. FEE-HELP is available, make sure that you read and understand the information on FEE-HELP here and make sure that you include on your application that you would like to use FEE-HELP. How will I attend lectures? Online, face-to-face or a combination of both. This differs depending on the Teaching Body that you decide to study with. Contact the registrar of the applicable Teaching Body for further information. Change of name documentation and/or the results of an IELTS test if relevant. The registrar at the Teaching Body you are submitting your application to will let you know if there is anything else that you need to provide. What do I have to do to make sure I complete my course successfully? At least three units in Biblical Studies. At least three units in Theology. 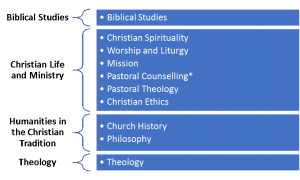 One Major within the area of Christian Thought (this includes Theology, Biblical Studies, and Humanities in the Christian Tradition) or in Christian Practice (the Christian Life and Ministry Discipline). What is a major? – Six units, consisting of no more than two units at 7100 level, and at least one unit at 7300 level. I’ve done previous study in theology, what should I do? You could be eligible for credit, but this is capped at 16 units depending on the study you’ve completed. Have a chat to the registrar at your chosen Teaching Body about applying for this. I want to complete more study after my Associate Degree, what should I do? This depends on where you want to go in your career, and what your grades have been like throughout your studies. 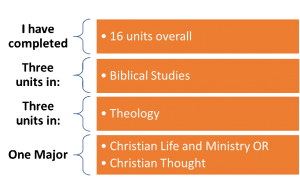 The Associate Degree of Christian Thought and Practice is both a stand-alone award and a nested award in the Bachelor of Theology and Bachelor of Ministry. This means that if you would like to complete one of these degrees after your associate degree you will receive full credit into it but you will be required to surrender the Associate Degree upon completion of the Bachelors. I think I’ve completed my studies, am I eligible to graduate? *Please note that a focus on Pastoral Counselling or Clinical Practice in your degree does not accredit you to be a counsellor. It is designed to give you extra skills in Christian/Pastoral Counselling which will enhance previous or future qualifications in Counselling.